If you’ve heard of the old radio shows from yester year like The Shadow or Halloween classics like War of the Worlds then you’ll like the modern day twist Hartlife, a team of multimedia actors and artists, has given the old genre. While strolling through artist alley, their booth caught my eye and I spoke to director Jeffrey Gardner about their newfangled internet audio drama. Jeffrey Gardner of “Our Fair City” at Chicago Comic Con 2012 from Martin Lindsey on Vimeo. Funny how small the world is. Turns out Jeffrey and I are coworkers. We both began working at the Museum of Science & Industry earlier this year. I bumped into him in the museum one day a few weeks ago, months after this interview, and said “Hey, do you have an internet radio show?” He said yeah and remembered us talking at ComicCon this past summer. It was great catching up with him again. Be sure to catch up on episodes of Hartlife’s Our Fair City, save the site and drop the guys a line to tell them how much you enjoyed it. Uraeus – also known as Richard Tyler – is the creator of the Jaycen Wise comic book. I took the opportunity to talk to him about his time traveling character who has made such an impact on the indie comics scene that it garnered him an interview from a local Baltimore news station. He talked about the follow up benefit of that interview including enhanced branding and awareness of the character in addition to more Facebook friends and well wishes via email. Take a look at the vid. We talked further on other points including how cool it was to me as a father that his sons were the inspiration for getting the Jaycen Wise series of the ground. He mentioned how we sometimes have to create the images that we want our children to take in. I could definitely relate to that. he took it as an obligation to do it himself instead of waiting for other entities to provide something appropriate and acceptable. And as we artists know, there’s no barrier to doing that with the current state of individual access to advanced technology. As for current and upcoming Jaycen Wise adventures, check out Ureaus’ first motion comic Jacycen Wise and the Eye of the Storm, a modern day not-just-your-average jewel heist produced in 2010. He’s working on motion co mic number two, Jaycen Wise on the Road to Infinity, due to be released in the next couple of months. It’s set in the cowboy era and he’s taking the opportunity to teach how the black cowboys helped settle the wild west. Ureaus says he has about twenty Jaycen Wise stories in various stages of production, some of which are dropping later this years and others in 2013 so stay tuned for the next adventure. Not only that but friend the Jaycen Wise Facebook Page and keep up with all of the series updates. So, how do you get gigs or work with people you admire in the comics industry? Same as in any other profession. Networking. Joe McFee tells us how he and Joe Currie recruited La’Drissa Bonivel to model as a super-shero for each of their comic universes. So the next time you’re at a comic convention or similar event strike up a conversation with that other creative you’ve always wanted to meet and get your juices flowing together for the next great collaboration. You’ve seen him referenced in a couple of earlier videos and now we profile the man himself. Joe McFee is the creator of Exigency Studios one of the independent African American companies representative of The Black Age of Comics. I first met Joe the way I’ve been meeting a lot of my artistic professional connections over the last three years, on Facebook. We met in person at ComicCon 2011. Fellow blogger Marcie Hill is asking the questions this time while I shoot. Here’s the interview. Joe has been amassing a cadre of comic artists in his sphere of influence, most notably Kim Moseberry and Joe Currie. 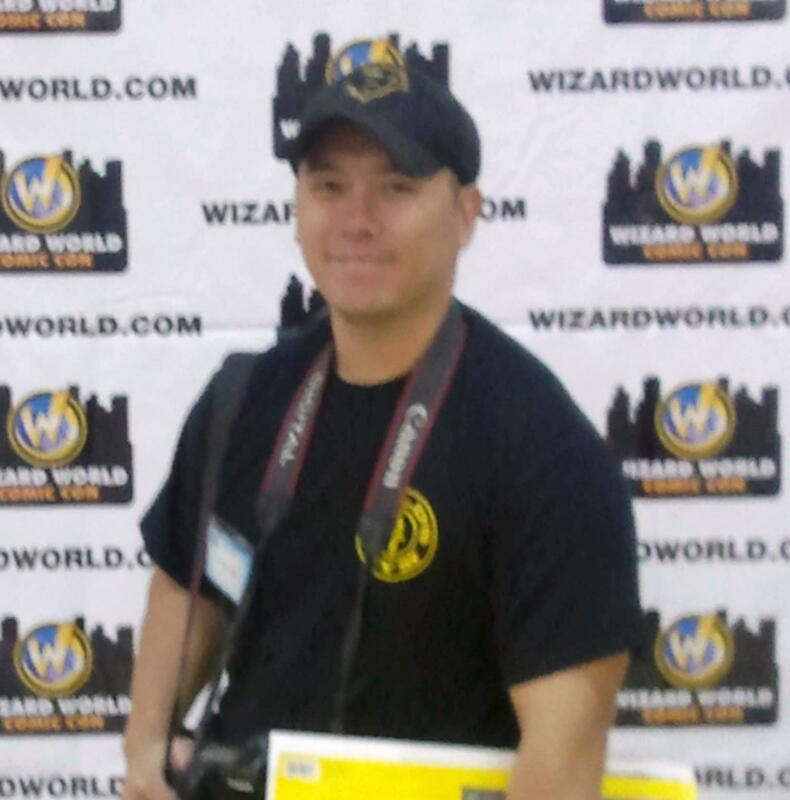 Kim is the interior page artist for the AWF comic series beginning at Issue #2 and Joe Currie of Strictly Underground Comics, hangs out with him with assorted comic conventions and events. And as he mentioned in the vid that’s Adrian Adams making an appearance behind Joe. He has done promo and poster work for the Amazonia Title. Joe and Xigency have been producing books at a consistent clip so keep an eye out for their latest projects. I had to laugh at myself after I finally got around to editing this video because I realized I had made the same mistake twice when I interviewed Joe Curry, the creator of the Punx of Rage universe of characters. Joe is the owner of Strictly Underground Comics but I mistakenly ask him about The Street Team which is a totally different team combination that his characters are a part of. So you’ll have to credit my error to the fact that I was still trying to figure out the various affiliations and collaborations he’s involved with :). But hey it makes for good organic film making so check out the vid and get to know Joe. Joe and I had met before at the DuSable Museum of African American History’s Annual Arts and Crafts Festival in the summer of 2011 and that’s where I hung out with him and a number of other Black Age of Comics creatives who were sharing a vendor tent. That meeting was the result of having friended him and a few other local indie comics owners on Facebook and finally catching up face to face so, thanks Joe for bringing this rising animator into your world. It’s a great professional match in my book and I’m looking forward to some collaborations of my own with this crowd. Keep you eyes peeled for more great issues from The Punx of Rage, The Almighty Street Team, including their first video game which you can purchase here. If you’ve ever seen a body building competition on T.V. and thought to yourself, “Hummm, they would look like natural super heroes if they had costumes.”, then your intuition is spot on. La’Drissa Bonivel is an IFBB Pro (sculpted women of La’Drissa’s ilk aren’t called body builders they are called women’s physique pros) and she travels nationally for competitions. She also has gigs as a super hero model for a couple of characters, Diva Gold and Prodigy created respectively by Chicago indie comic book creators Joe McFee’s Xigency Studios and Joe Currie’s Strictly Underground Comics. I had the opportunity to meet her in person at Chicago Comic-Con 2011. Take a look at the video and learn more about her ventures in the world of comics and professional fitness. La’Drissa is a multitalented lady as is evidenced by her other business endeavors. She calls herself a tri-factor as a skin care pro, yoga instructor & personal trainer. She’s also a motivational speaker. Check out her company Loyal Body and see if she can’t be of service to you in some way. Her star is on the rise so I wouldn’t be surprised to see her competing on T.V. or beating bad guys on film some day soon. Kim Moseberry is one of the comic artists who works with Joe McFee, the founder and owner of Xigency Studios in Chicago. You’ll learn more about Joe in a future post but this one is about a very talented young lady who Marcie and I got a chance to talk to at the Xigency booth at Chicago Comic-Con 2011. We had a good time talking to Kim and I even got a copy of the mermaid pirate print. She is a really talented artist. Check out website that she mentions in the interview and you’ll see what I mean. It’s a nice portfolio of work. Kim and the Xigency team are building up their name on the comic circuit. I look forward to great work from them. Who Are All These Grown People Playing Dress Up Super Hero? It’s the cosplayers. Fellow blogger Marcie Hill hung out with me at Comic-Con 2011 last summer in Rosemont, Illinois, one of the suburbs of Chicago. I think we were both equally fascinated with the costume players, affectionately known as cosplayers. At first I thought they were kinda weird. Why would adults dress up as super heroes or villains and not be thoroughly embarrassed? Well I guess when you’re in a building full of others doing the same there’s nothing to be embarrassed about right? After taking in the scene for a while my artistic brain kicked in and I begin to appreciate the makeup and costume creating talents of some of the participants. I started thinking some of these people might be hirable for poses or short film projects. I couldn’t walk out in public like that myself but I began to enjoy the artistry and humor of it all. Fun bunch of people. There’s no effort on my part to edit or compose this footage. I’m just sharing it with you as taken to give you the spontaneous feel of mine and Marcie’s presence in the crowd. Thus, the loose flow of it is simply as-it-was. As you see people enjoy posing with the cosplayers and the players love obliging them. You can hear me egging them on in their antics as well. I’m seriously considering making this crowd an annual post unto themselves so look out for the 2012 rendition later this year. How many people get to tell their life story in heroic illustrated fashion? Yorli Huff is one of the few among us who can make that claim. Yorli is one of many people in the comic industry that I’ve connected with and been networking with on Facebook and I got to meet her in person during Wizard World weekend. It’s funny how we finally crossed paths on the convention floor. I was walking with my head down taking notes or fidgeting with equipment or some such thing and someone walking the other way down the aisle shoved a couple of cards in my hand. I looked up and it was Yorli and her artist Derrel Spicyy handing out Special Agent Phaedra shields and Veil of victory placards. I looked up and realized that it was her in the flesh and I said “Hey Yorli, I was coming to see when I can interview you.” We shook hands and she said “Give me ten minutes. I’m going to get an autograph from Pam Grier.” Couldn’t argue with that (LOL) and I caught up with her and Derrell at her at her table a few minutes later. Two things to love about the comic is that there is no cursing and none of the characters die so it’s appropriate for all ages. I walked away a happy customer with my autographed copy. As you can see from the interview Yorli is a busy lady. She has the comic book and her real life story The Veil of Victory. Also be sure to friend her on Facebook to keep up with her latest public appearances. The Secrets of the Superstars panel hosted by Glass House Graphics artist agency CEO David Campiti featured two of Marvel Comics finest in a discussion on secrets of the comics business. His international talent company helped launch the careers of panelists Mike Deodato (Secret Avengers) and Will Conrad (X-Men) and all three shared thoughts and answered questions. Create a portfolio with the characters of the company you want to work for. They want to see if you can draw their universe. Tell the story with as few words as possible because you will be limited by word balloons. Omit common American phrases because you are writing for an international audience. Learn to draw poses with shadows and practice drawing the folds in clothes. Use reference images or personal photographs of things that interest you to practice drawing. It’s great advice and simple to apply. These guys obviously enjoy what they do and get a lot of pleasure out of being comic artists as you can tell by this video from the Glass House Graphics web site. As you might expect from top flight professionals both Deodato and Conrad are self taught artists (most comic artists seem to be) but they both continue to study in order to constantly improve at the craft. Mike emphasized that knowing more can only help you by making you more versatile. One response to a particular question was that a tool is a tool and you should become as comfortable with as many traditional and digital drawing tools as possible. Will Conrad shared his typical day with us. His day can start with taking the kids to school then getting home to work from 7:00AM to 12:00 noon. He’ll take a break for a little while and get back to it from 2:00PM to 6:00 or 7:00PM. Then he’ll allow a longer break for family time and life and he’ll hit it one more time from 11:00PM to 1:00AM. As a parent and a graduate student I can identify and his answer was very affirming too me. David gave great tips on how to assemble a sample test plot before submitting a portfolio. His company has a wealth of information on the process so you guys should definitely read up on it if you’re serious about breaking into the industry. Secrets of the Superstars was a great panel. I can apply much of what I learned and I hope that you can do the same. One of the best parts of Comic Con is the hourly information presentations you can attend on all sorts of comic related subjects. One particular subject I wanted to learn more about is inking and D.C. Comics inker Tom Nguyen is one of the best in the industry. I got a chance to sit in on his session “Tom Nguyen’s Style of Inking” Friday afternoon at Chicago Comic Con 2011. Don’t know what an inker is? That’s the second person in the creative process of making a comic book or graphic novel. The penciler draws all the panels and then they hand it off to the inker who makes the dark outlines, shadows and backgrounds. The letterer handles the lettering including thought and speech bubbles along with effects lettering and the colorist finishes it off to bring the page to life. D.C. Comics inker Tom NguyenTom shared a lot including the tools he uses and his daily routine. One of the cool process things he taught us is the fact that comic artists never create at comic size. Everything is done on an 11 X 17 Bristol pad. 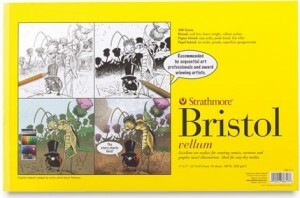 When each artist has done their part the Brystol is reduced to comic page size for publishing. The Brystol page has a cardstock type of texture. That’s probably because it’s going through so many artist’s hands before reaching the publishing stage. Some inking tools include Micron pens which come in a few different sizes. He said Sharpies are good to use for concept art but not serious inking because you can encounter bleeding issues and the tips get blunted with use. He also noted that technical pens are good for drawing mechanical objects and borders. Tom prefers to use brushes (size 1 or 2) with India ink though. Windsor and Newton is his favorite brand but he said it’s not necessary for a beginner to use a top of the line brush like that while learning the craft. He mentioned that some inkers like to use crow quill pens because they give you great control over line variation but they’re not for him as the tips wear out so quickly. He also uses brushes for black fill in. When working digitally he fills in the blacks with the Photoshop fill bucket. White-out pens or thinned white acrylic paint are commonly used to correct errors. The final tool in the inking process is the prep work to pass it on. That requires a scanner and Tom uses a large format Epson scanner. After this point the pencilers and inkers usually work out personal agreements on how to split the original art. Sometimes they keep it for themselves and other times they sell it. Inks are actually some of the coolest for sale work in artist alley at the convention. It was also good to learn about his daily routine and personal journey into the profession. He makes it his goal to complete one page a day and while he’s working he likes to listen to music or documentaries. Not watch documentaries, just listen to them (LOL). Tom got into the field at the age of fifteen by working with D.C. artist Doug Mahnke in Minnesota. A few years of that was enough to get him started full time at the age of nineteen. His answer to the question “what if you don’t know anyone in the industry to get an internship” was to attend conventions and show your work there. You can ask for critiques from the pros on the spot or online. People asked lots of good questions and Tom made lots of other great points during the session. He capped it off by giving us a demo of inking in Photoshop with a quick Batman sketch. Using his digital tablet and stylus he mentioned that he uses the default brush settings. He doesn’t bother with creating his own. The most interesting technique pointer was that changing line width when you encounter a change in direction on the shape or character makes it look more dynamic (he said to think “thick-thin, thick-thin” while working) . Techniques like that are what makes the inker more than just a tracer of the penciler’s original work. Another cool part of his Photoshop demo was the way he used the lasso tool to make corrections. Most of us who use the software only think to use the lasso to delete a section of a layer or to move the lassoed section to a new layer. He used it to reposition a couple of sections of the Batman face and edited it back together using the eraser or clone tool (I don’t remember which) and then redrew where he needed to reconnect the shifted parts of the face. It was a great choice of a first session for me and I walked away with some ideas that I can immediately apply in animation school this fall and going forward in my career. Tom isn’t a one dimensional artist. Among other things he’s an accomplished photographer as well. Check out his photography site here. Also keep up with Tom’s projects on social media via his tweets at @tomnguyenart.